It’s a funny old world isn’t it? 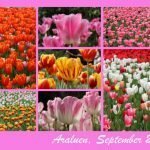 As an expat I’ve embraced social media and blogging as a way to keep in touch with friends and family who are scattered all around the globe. I’ve renewed old friendships and made new ones, and kept in touch with loved ones. The downside is that I don’t write letters anymore, because I don’t have time. My Christmas card list is down to about 10 people, and the dreaded round-robin Christmas Newsletter is thankfully defunct! 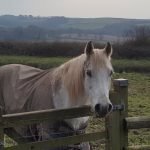 So for those that ask here’s the start of a new series on this blog – A sneaky peak into My Little Corner of the World. I hope you enjoy, and I hope it inspires you to tell me in the comments what’s been happening in your lives wherever you are too. 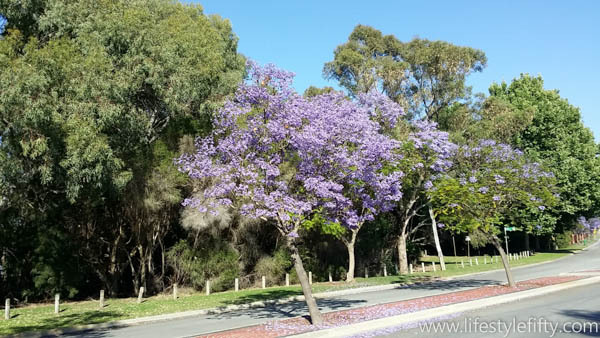 I love this time of the year in Perth. 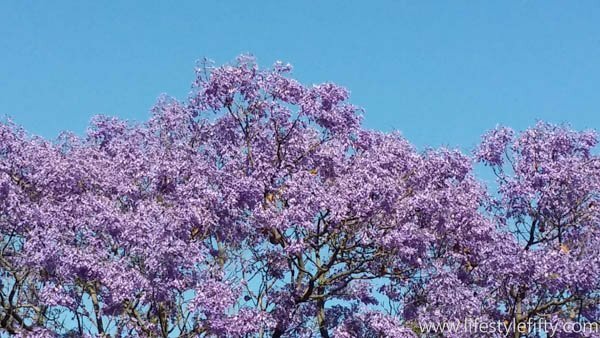 The Jacaranda trees are out in full glory and it seems that everywhere you look, or don’t look, there’s a flash of lilac in the treetops and a carpet of purple petals on the ground. My mornings generally start off with an early morning walk or bike ride, around 6am, and the sleepy Swan River is always beautiful before the world wakes up. It’s a haven for water birds. 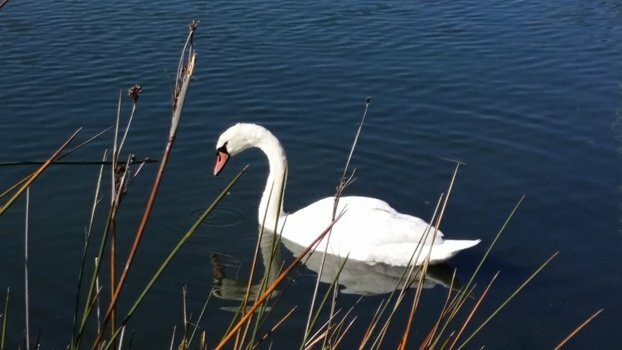 On my rambles I often sea black swans (occasionally white ones) pelicans, purple swamp hens, ducks, cormorants, ibis and a few birds I have no idea what to name, plus I might be lucky to hear kookaburras cackling from the branches too. Coffee Perth style is expensive, and people complain about it. 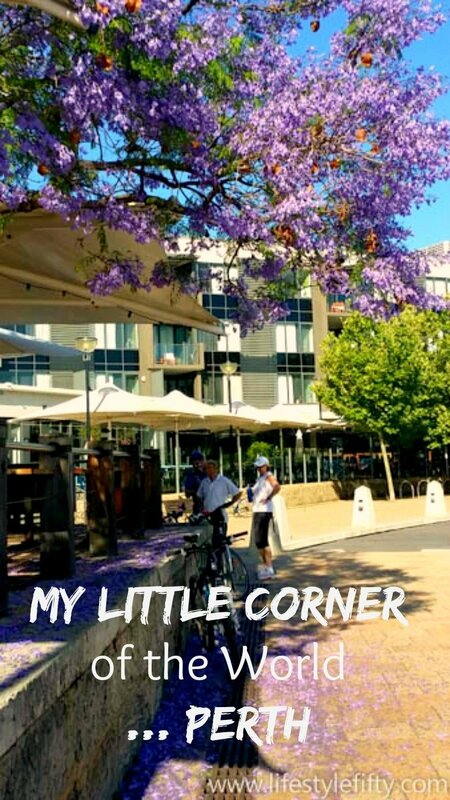 But there’s nothing to complain about when you can go for a cycle ride and then lap your latte at beautiful al fresco locations like Claisebrook Cove in East Perth, below. Hey that’s us on the bikes below 😉 Thanks Jules! At this time of year though it’s all about the beaches. This weekend we went on a coastal cycle ride to Perth’s northern beaches. We started off at Cottesloe (where Prince Charles had just celebrated his 67th birthday – pity we weren’t invited!) and we rode 25 kilometres north all along a designated cycle path to Hillary’s Boat Harbour – although we were well past Cottesloe when I took the first photo above. The white point at the end of the curve of the bay pretty much marks our end point. Anyways. Then we rode back! Even though we’d started at 6.30am, it was getting blimmin hot by the time we arrived back at Cottesloe where we jumped straight into our swimmers and had a cool dip. That’s the thing about Perth in summertime – it’s best to be an earlybird. Cottesloe is considerd Perth’s most iconic beach with white sand and majestic Norfolk Pines offering shade on the grassy areas. There’s a buzzing cafe (and bar) strip right beside the beach. It’s a great spot for a swim, surf, snorkel, picnic, sunset drinks, or a fish and chip dinner by the sea. 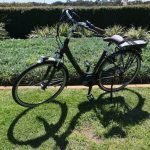 We cycled from Cottesloe Beach past Swanbourne Beach, City Beach, Floreat Beach, Scarborough, Trigg Beaches, North Beach, Waterman’s Bay, Sorrento and to Hillary’s Boat Harbour in the space of 25 kilometres. 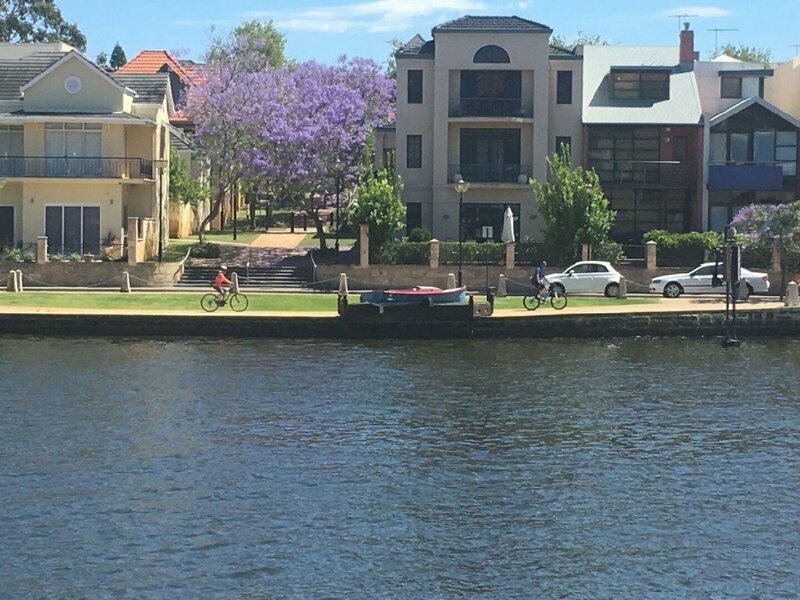 Perth bike trails are Perth-ect. We have so many, and not too many hills. Earlier in the week I had lunch with some talented blogger friends at a Thai restaurant in Leaderville, which is a bustling, vibrant ‘village’ north of the city. 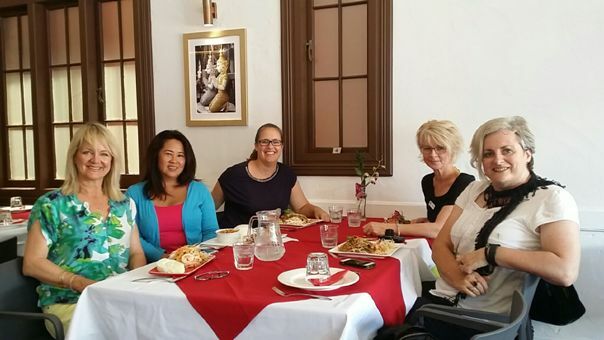 There’s Aggie Lim (Drawn to Explore), Amanda Kendle (Not a Ballerina), Rae Hillhorst (I opened my mouth and it ran away with me), Glennys Marsdon (The Ponder Room) and Dianne Bortolleto (not in the picture) from Pronto. 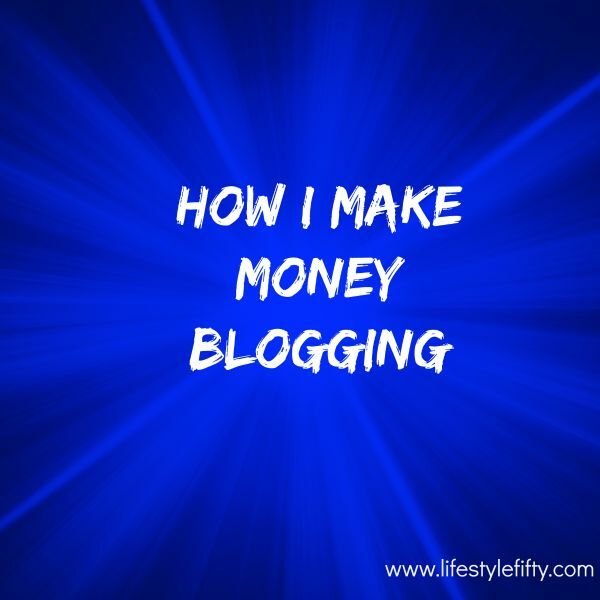 They all have wonderful blogs. And I’ve been modelling – Hah! Who’d have thought at my advanced age! 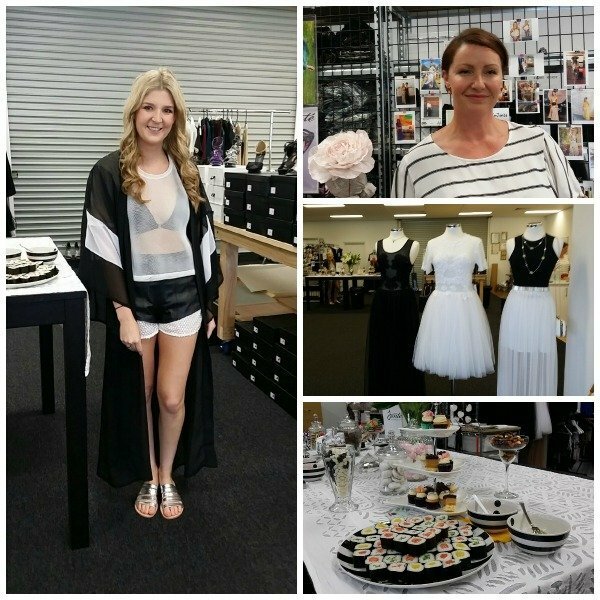 I can’t tell you what fun it was, and it was also an initiative with a talented young local designer Jonte for Frocktober (ovarian cancer awareness) which some of you have kindly donated to through my fundraising at Everyday Hero. 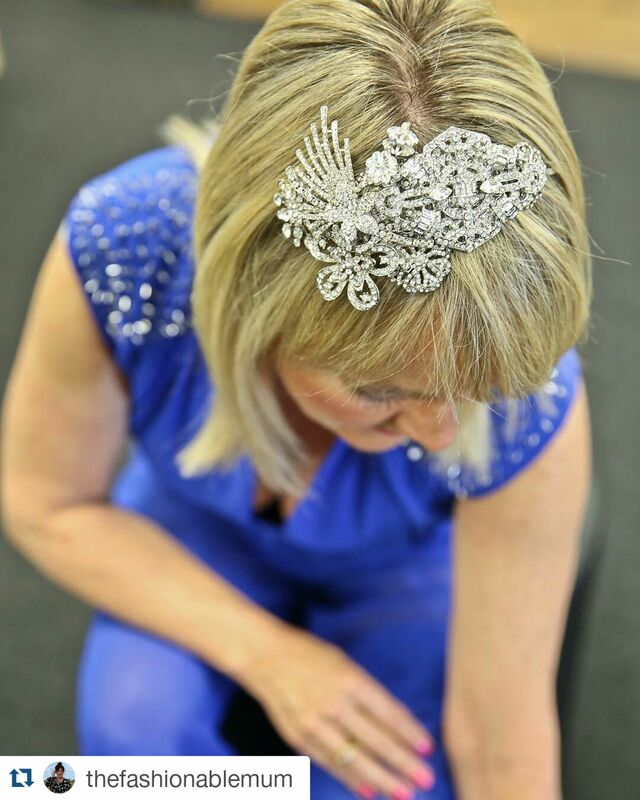 I just love the headpiece I was privileged to wear. The photos above were taken by Samara from Pincarnie Photography and I’m with Jonte’s lovely Mum, Michelle in the bottom right pic. 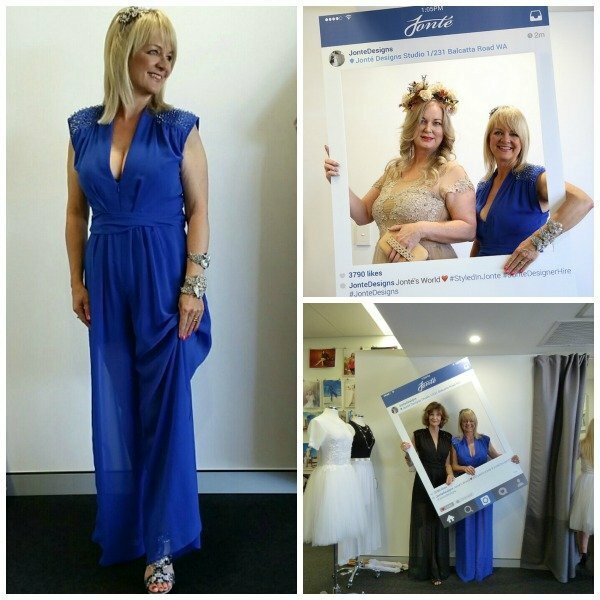 Below is Jonte from Jonte Designs who is making such a name for herself on the Perth fashion scene, and to the top right below is lovely Vicki Thomson from The Fashionable Mum, the stylist who put all the models ‘looks’ together so beautifully on the day. Dave and I were invited to the opening night of a fabulous Aboriginal art exhibition in Perth where we met up with a friend I first met when I was backpacking in 1983. 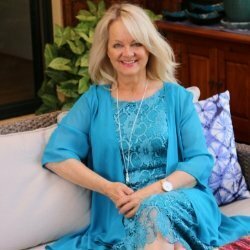 Jules lives in Sydney now and she’s a business strategist with her own business, Breese Dynamics. The exhibition was promoted by Woodside in St George’s Terrace. It was called ‘Ngurra Nyingu – We are from this Country’. We resisted buying a painting, although we were sorely tempted. The photo below is of the back of the brochure which is indicative of all the beautiful artwork on sale. Then it was all hats and fascinators and derring-do for the Melbourne Cup. 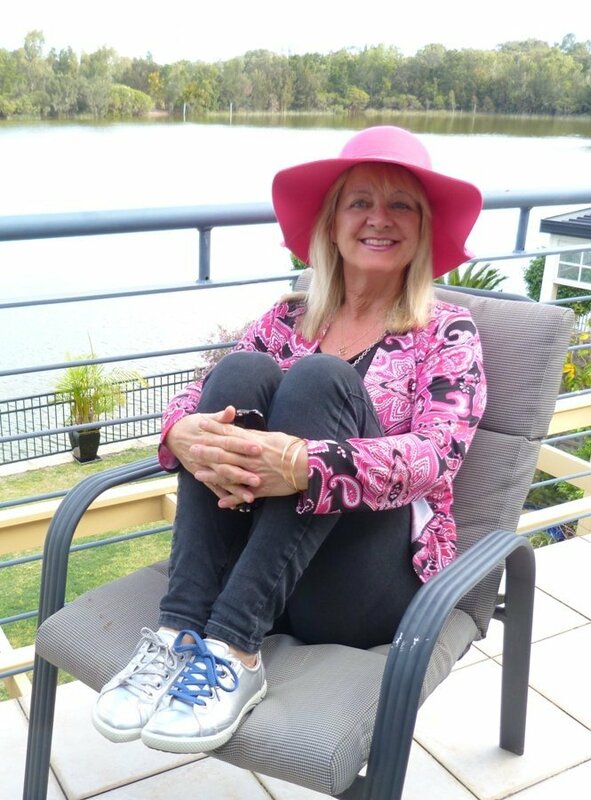 I was lucky to get invited, by my friend Christine, to a celebratory luncheon at a golf club. At the weekend we had an amazing electrical storm after a very hot day when the mercury topped 40 degrees. Yes, it was unbearable. 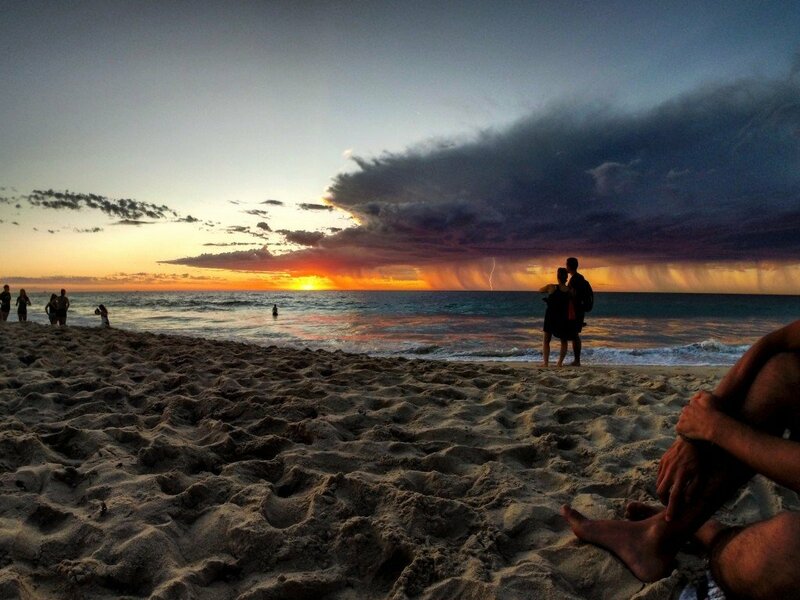 The lightning strikes that evening were vivid and intense and carried on for over an hour, sweeping south down the coast, and my talented daughter took this pic as she and her friends were watching the sunset at one of Perth’s beaches. You can just spot the lightning. And finally, as the sun sets on another hot sunny day in this remote part of the world, I bid you Goodnight from Perth’s beautiful city skyline. Please let me know what’s been happening in your corner of the world in the comments – I’d love to hear. How Northam WA taught me the importance of being nice. Thanks for the insight into your world. 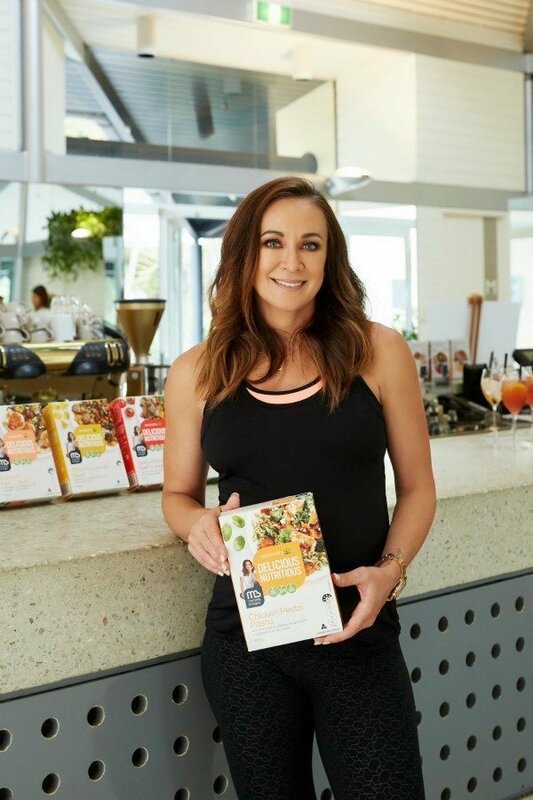 It is a great idea – I think everyone likes to see what other’s lives are like. The beach storm photo taken by your daughter is fantastic. 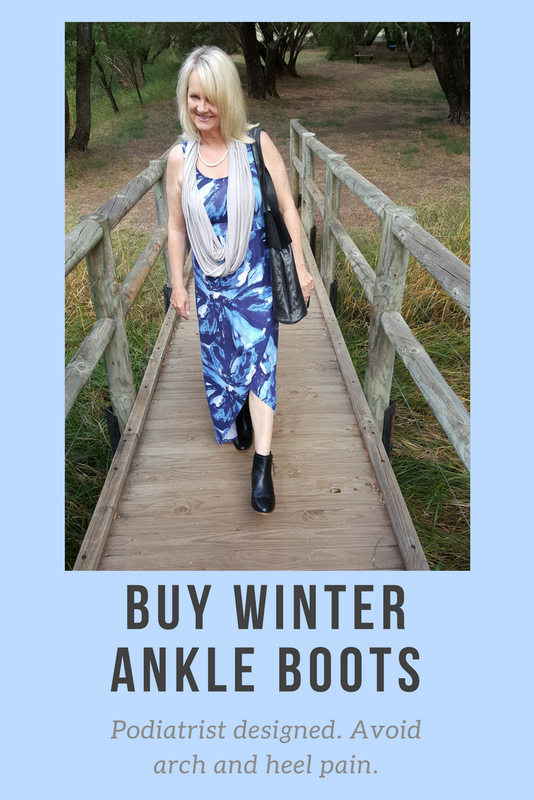 Your beach bike ride would have been amazing too – I wouldn’t have liked to do it when the Fremantle Doctor was around! Perth’s beaches are spectacular and this post makes me miss them like crazy. 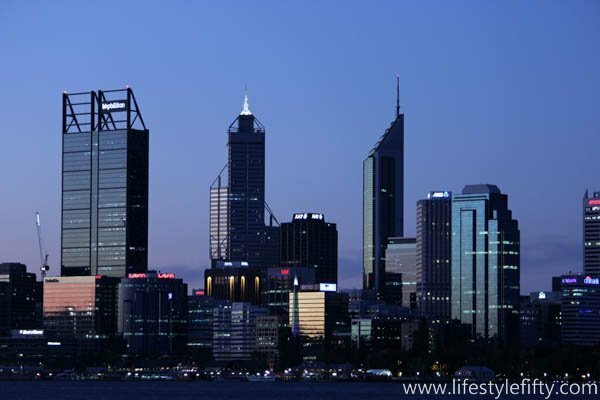 Look forward to your next peak into your life in Perth. 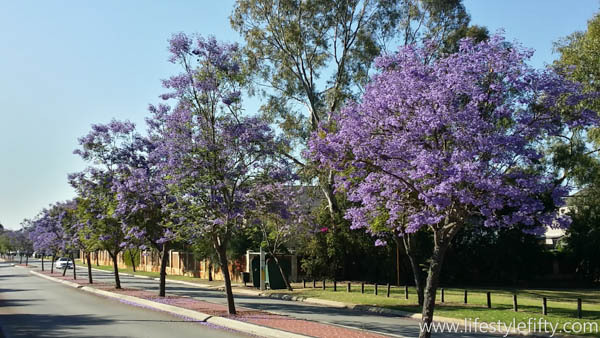 Love Jacarandas – they don’t like growing in Townsville that much although we do see the occasional one. Loved this. I live on the other side of the world in the U.S. This gave a wonderful glimpse into Australian life. How great to stop and reflect what you’ve got up to of late – Its so easy for the time to fly by and forget all the wonderful things you’ve done and achieved… and gee you’ve been busy! Thanks Linda. Yes time flies and just taking a breather to remember all the good things is really therapeutic. Writing things down also feels like the true spirit of blogging. I loved this post Jo. I am so impressed with your bike riding. I haven’t been on mine in ages. 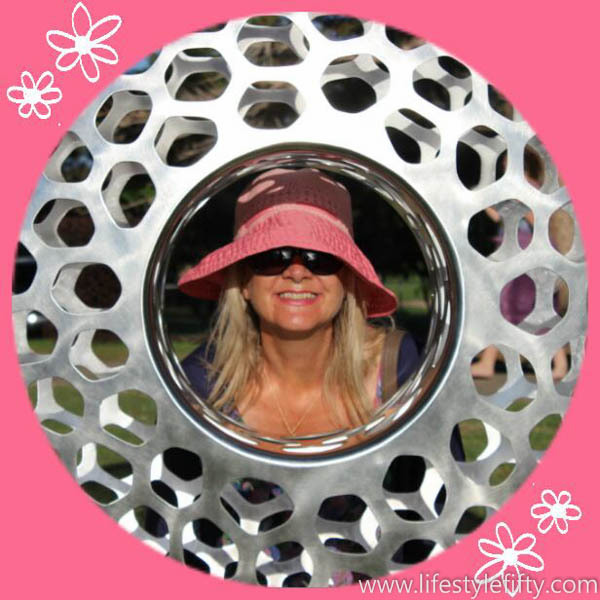 It is amazing how many great activities we pack into our lives and this post gives me some idea of life in Perth as opposed to the East Coast. Also love you in that long blue dress. Blue is definitely your colour. Thank you Kathy. I have been fantasising about life on the East coast of late so needed to rein myself in!I do love blue ( and pink;) but like you say I think blue suits me, so thank you for the heads up too. Ahh thanks Rae … a sneaky peak but hopefully enough to show the flavour of spring.